Sensirion make a family of combination humidity and temperature sensors with a 2 wire bus. They have high accuracy and resolution. The I2C to PC can read up to 3 of them directly. 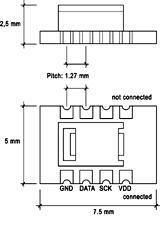 They do NOT use I2C bus, but they are a very useful and unique sensor, and can be read by the BL233 and I2C2PC. For inexplicable reasons, Sensirion have made a bus that is uses very similar elements to the I2C bus, but is utterly incompatible. Can NOT share a bus with I2C devices, each device must have its own bus. Make sure to put a 100nF capacitor across VDD and GND! To read we use the SPI commands and bit-bashing modes of the BL233. The example below assumes that the device is connected to bus#1. For other buses the bit-bashing commands ('O....') must be changed. The BL233 should be in the stoP condition before beginning. To make a simple logger for temperature and humidity, just put the commands you need from below into a text file call shtdata.txt, and use Realterm to automatically send the file, and capture the result. The first byte is the command byte. The last bit of the command byte is 1 for all read commands, and 0 or all write commands, like I2C. We use SPI mode, writing one byte, and then reading the single ACK bit from the SHT. Command 03 is “Read Temperature” and 05 is “Read Humdity”. The BL233 will reply with FE when it reads the ACK bit. If the pause is too short, one or both of the following data bytes with be FF. The timing is +/- 15%. We read each data using an SPI read.